SYRACUSE, N.Y. - The SUNY College of Environmental Science and Forestry (ESF) Friday will celebrate the installation of its powerful new nuclear magnetic resonance spectrometer. The unit is the first of its kind in Central New York. The 600-megahertz spectrometer, known as an NMR, is a focal point of the college's state-of-the-art Edwin C. Jahn Laboratory. It allows scientists to examine the structure of molecules and put that knowledge to use in the development of new products. The NMR came to Syracuse through a joint effort involving ESF, Syracuse University and the SUNY Health Science Center. All three institutions pooled their money to purchase the unit, with most of the $725,000 coming from ESF. At the time it was purchased, ESF also upgraded its less powerful 300-megahertz NMR. 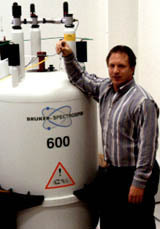 ESF instructional support specialist David J. Kiemle with the college's new NMR. NMR is the parent technology from which the widely used magnetic resonance imaging technology was developed. In effect, an NMR unit visualizes molecules in the same way an MRI unit creates an image of a human body. NMR allows the chemist to visualize a molecule by single atoms, providing exquisitely detailed structural information about complex molecules, both natural and man-made. The NMR unit at ESF is unusual because it can be used to analyze liquids, solids, and gels at very high magnetic field strength while most such machines work only with liquids. The college will sponsor an open house from 2:30 to 4:30 p.m. Friday, May 7, adjacent to Room B18 in the Jahn lab. There will be a tour of the NMR facility and poster presentations explaining its uses.